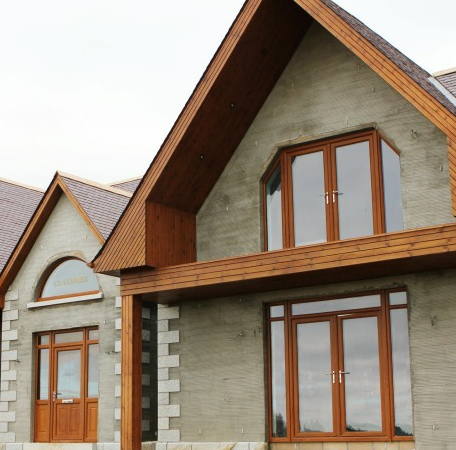 ﻿ Kestrel Cladding SLJ Windows and Doors Turriff, Aberdeenshire Windows and Doors Suppliers Turriff Aberdeenshire. Our supplier, Kestrel was established in 1990 to provide a full range of U-PVC, PVC-UE roofline, cladding and window finishing system products within the building and construction sectors selling only through a network of stockists and distributors. Today, with sales in excess of £30 million, Kestrel has achieved market leadership through a customer focused approach and a clear commitment to being and offering the very best - in products and service. Kestrel offer one of the widest ranges of U-PVC, PVC-UE Roofline and Cladding products in the world, manufacturing over two million metres of profile every month. The range extends to over 800 products, the majority of which are BBA and BS Kitemark approved. All products are manufactured within an ISO9001 quality management system and within an environmental management system which satisfies the requirements of BS EN ISO 14001:2004. Kestrel has recently been independently certified to BES 6001. They have met stringent manufacturing criteria to achieve this ‘green’ standard which means their customers can be assured that as a company we understand our responsibilities and source raw materials in an ethical and sustainable manner. All of our double and triple glazing is energy efficient which guarantees our customers the best product available. In simple terms, the windows help to contain and conserve heat within the home. Keeping out the wind and rain, resisting condensation and yet allowing natural “free” energy, the warmth of the sun to heat your home. Manufactured in our Turriff workshop, all our windows and doors are custom made to your individual requirements. We personally advise on what style of windows and doors would suit your home best. From traditional sliding sash to contemporary casements and smooth gliding bi fold doors, we offer a full range of frames in a full range of colours and veneers. Over the years SLJ Windows and Doors have not only supplied the domestic market but have also concentrated our expertise in window fabrication for the commercial sector. From large gable end frames to energy exit doors, we can custom make your requirements in a wide variety of styles and colours. Over the years SLJ Windows and Doors have dramatically grown our facility here in Turriff, constant re-investment has enabled us to grow significantly and we can now produce over 200 units per week. Using the latest state of the art machinery and equipment our facility uses the latest computerised window and door manufacturing equipment, producing his specification designs to meet the continuing demand of both our residential and commercial client base. As we continue to grow further investment will take place in order to keep us at the forefront in terms of high specification door and window manufacturing. Over the years we have completed many projects throughout Aberdeenshire for both residential and trade clients. Our portfolio is constantly being added to and as time progresses more images will be uploaded. In the meantime, please click on the links below to view a small selection of our work which we hope you enjoy.